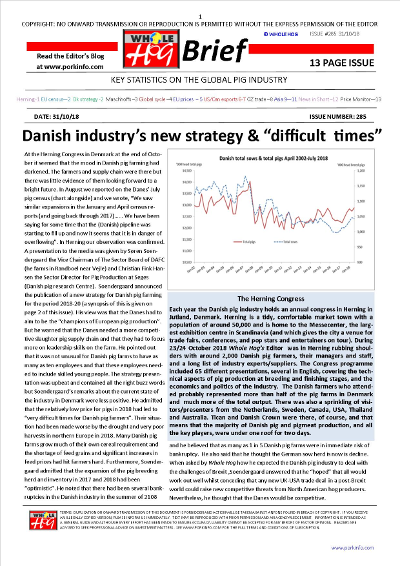 The first page of the October 2018 issue presents a review of the Herning Congress in Denmark, Page 2 reports on the mid 2018 EU pig census and the new strategy for the Danish pig sector. 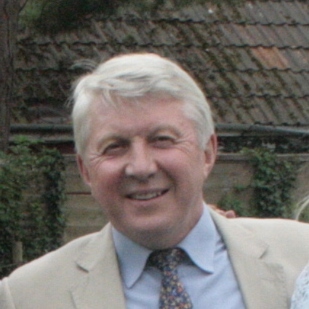 Page 3 is a review of a presentation given by the President of The Maschhoffs on this major US producer. Page 4 reports on the global pig price cycle. Page 5 presents the EU pig price data for October 2018 and export trade data for August 2018. Page 6 presents the export numbers for Canada – US sales have fallen steeply. On page 7 the USA’s exports have also slowed – volume and value of exports are down in August. On page 8 Australia’s trade data show exports growing whilst imports have fallen back again. Page 9 reports on the trend for Japanese demand for imported pork. Page 10 reports on growth in the South Korean market in September. Page 11 reports on the Chinese market: prices are levelling out. 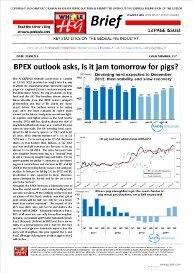 Page 12 presents short news items covering: ASF in Japan, W H Group, ASF in Romania, Maple Leaf Foods, McKinsey and Rabobank’s Q4 global pork forecast. On the back page there is the price monitor for 18 countries and the chart of the week – cold storage reports for the USA, and the short view of pig prices in the USA, EU and China in the next four weeks.